Wanted: Vash the Stampede. Bring this extremely dangerous gunslinger in dead or alive and you will be rewarded $$60,000,000,000 (that's two rewards of $60,000,000,000 each). But be warned. This ‘Humanoid Typhoon' has left whole towns leveled in his wake. Think you can take Vash down? Think again. Records show that those foolish enough to go up against the man usually stagger away from self-inflicted damage. 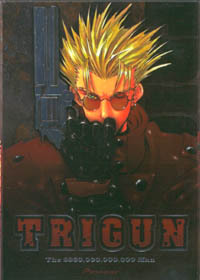 Trigun, as a whole, is like a bad cross between Battle Angel and You're Under Arrest, with Vash playing a clumsy version of Ido (Gally's creator from Battle Angel), and Meryl Stryfe and Milly Thompson acting like Miyuki and Natsumi with a dash of Kiyone and Mihoshi from Tenchi-Muyo!. All these character traits and the fact the show is set on a desert planet that never evolved past the "old west" motif make for a pretty unique show, to say the least. The TV translation of Yashuhiro Nightow's manga shines in the aspect that it gives a fresh take on the "bounty hunter" type of stories that have flooded the market. But on the downside, Trigun has too much slapstick comedy shoved into each episode, even at times when the episodes are meant to be serious in nature. The sheer fact that the main characters are so transparently naive about who Vash is make the show lose any ground it may have made in its originality. It is also worth noting that the opening sequence featuring the song ‘H.T' perfectly embodies what the characters are about. Vash is a menacing guy in a red trench-coat with a big gun until the very end where we see him on the floor with a bullet hole outline on the wall behind him. The English dub features many of the familiar Pioneer voices, but the dub script has numerous revisions to make the show have even more of a western touch. In many instances, more western-ish words and even cuss words were added when the subtitles clearly have none. Likewise, there are also places where the opposite is true. The DVD is a step up from many of Pioneer's more recent DVDs. Though there aren't many special features (just 26 character sketches, 20 stills, and the DVD credits), the menus feature bullet hole scene transitions, menu movement, and even sound. A pretty nice menu system overall. In short, Trigun is so hopelessly stupid it isn't even funny. And a foil embossed cover and Todd McFarlane 3D Animation From Japan: Vash the Stampede action figure may not be enough to redeem this 8 volume series. Especially with so many other involving series coming to the stores these days. If you're pressed for money, avoid it go for Cowboy Bebop instead.